Venture Magazine International got in touch with us at Todich Floral Design, They were interested in an interview with the Managing Director, they asked us about new brides, recent trends plus the difference between Asian and English flowers. Below is the full interview which we hope you enjoy. Todich Floral Design is an award winning wedding and event’s florist that has a highly skilled and creative team of managers, experts and florists who are passionate about flowers, having been in business for over 15 years; Todich Floral Design has built up an exceptional reputation with both clients and contracts. Based in South London, We provide a bespoke bridal flower service throughout all of London and the south east of England. From ceremony to reception our flowers create the perfect mood for a bride’s big day, we are proud to say that we treat each of our happy couples with the best client service. One of the most important days of a couple’s life deserves an expert florist’s attention and planning. Attempting to blend artistry & elegance with our own innovation, We produce high quality designs on a daily basis, Our aim is to turn floral dreams into reality, our florists create fresh, innovative, contemporary arrangements which keeps bringing clients back over and over again. What should couples be aware of when selecting a florist for their big day? Nothing ties your wedding together quite like your wedding flowers, so it is vital that the florist you book is the right one for you and your style. Good florists get booked up quickly; therefore it is essential that you look for the right florist as early into your wedding plans as possible. We recommend you meet your chosen florist in person, take a note of the their website and style, Ask yourself – do they look like they are bursting with fresh ideas or that they have been stuck in a rut for the last 10 years?, If first impressions are good, ask to see the florist’s portfolio, paying particular attention to past weddings that they have worked on. Couples should also be aware that it is important for the florist to know how much that you are willing to spend; this should be discussed in the first consultation, and that the florist can then recommend designs within your price range. Know what you want, don’t feel obliged to book anyone there and then. If you need more time to make your decision, just say so. A good florist should understand how important it is to choose the right person. Lastly ask for a contract – Before you sign make sure you receive a written quotation. This should clearly list the prices that you have requested in the consultations. Once you are happy with this should you enter into a contract with them, when you have confirmed your order, you’ll probably be asked to pay a deposit, with the final balance due a few weeks before the big day. Bear in mind that if you change your mind about the flowers you want or the number of arrangements you require in the run-up of the wedding day, this could affect your final bill. What are some simple things that a couple can do to ensure that their flowers are consistent with what they visualized for their wedding? It is recommended that couples should take the time to identify the central, personal theme of their wedding, as this can shape the decorative style of the whole day. For some brides, their theme may be a colour, a piece of music or era, while for others it may be jewellery or vintage. Once the bride has found her theme and costumed her wedding to this style, it can become very inspiring for the florist. Many brides are consistent with the theme throughout the wedding from the bridesmaid’s dresses down to the stationary and furnishings, putting a scrapbook together of your theme including colours and fabric samples will make this a much easier visual display for the florist to match the flowers within your wedding venue. Can wedding bouquets be customized or can only certain flowers be used in bouquets? The wonderful thing about flowers is that there are hardly restrictions; with a huge variety of colours, styles and flowers, there is a diverse range for brides all year around. Your bouquet can always be customised to your taste, If you are after a classical period bouquet then It is the attention to minor details that is important in creating this style, accessorising is key, and incorporating diamantes, pearls, brooches and velvet ribbon can made your flowers stand out and be a beautiful unique design. What is the customary process for placing deposits and paying the remaining balance? At Todich floral design, you simply pay a 20% deposit to secure you wedding day with us. This way the whole day is solely devoted to you, we understand the emotions for the perfect wedding with every bride which is why we pledge to provide you with the best service possible. We arrange only your flowers and aim to make sure that the flowers are perfect for your wedding day. The remaining balance is due a month prior to the wedding, this is so that we can reserve your chosen flowers in advance, as well as order in any accessories if required from the discussed consultations. How do Asian wedding florals differ from English wedding florals? The flowers of an Asian wedding tend to predominantly be bright, vibrant colours; a mix of oranges, reds and yellows seems to be the main theme, bright and beautiful is the key. Asian brides traditionally do not hold a bouquet but instead the bride, groom and guests wear colourful garlands. The flowers of an English wedding are dependent on season. Spring and summer weddings are always most popular due to the weather and the beautiful flower varieties you can choose from at this time of year, Traditionally bouquets consist of white and one other simple colour, however now, vibrant splashes of colours such as a bouquet of sunflowers and cerise gerberas seem to be an up and coming modern trend. Are the flowers for the ceremony and the wedding reception two separate orders or are they typically all ordered as one package? The flowers for the wedding ceremony and reception are treated as one order as it is all written in one quote, we however do dispatch separately as we would have discussed with you in the consultations. How far in advance should couples order their wedding flowers? One year before the wedding date we recommend the happy couple compile a scrap book of ideas, this way determining a theme, colour and style of the day; this will give the florist enough inspiration to match the flowers to your style. As a rule of thumb, we recommend discussing flowers with your florist once the dress has been chosen. Considering that weddings take place on specific times and dates, how can a couple ensure that wedding flowers are delivered at the right time, for the ceremony and the reception? Keep in touch with your florist, arrange plenty of consultations, and make sure your florist has a list of emergency contact numbers. 3 days before the wedding, check that the florist had ordered all the flowers. Always make sure that all important information is in writing confirming both florist and the clients and mutual agreement. Most florists set up three hours before the ceremony, so couples must plan a suitable schedule, we recommend that couples double check with the venue that the florists will be able to set up at a pre-arranged time. Is it fairly common for couples to meet with the florist prior to their wedding? If so, what should a couple bring with them to a consultation? 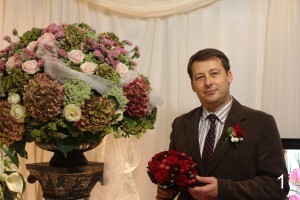 It is very common for couples to meet up with the florist; we always arrange more than one consultation with future brides so that we can develop a relationship and an understanding to exactly what you wish, the florists at Todich floral design truly believe that the most important thing about the initial consultation is the rapport. Prior to the consultations we recommend that every bride should put together a scrap book of ideas. Gathering favourite images of flower varieties from magazines and the internet is a great way for brides to find what they do and don’t like. We advise adding photographs of your chosen venue in the scrapbook as this will also help us and you determine the looks you are after. When you have chosen your wedding and bridesmaid’s dresses, build to your scrapbook, treat it like a mood board, creating pictures of your dress, adding fabric samples and different textures to create more inspiration for your big day. Your scrapbook will be your guide to your favourite colours and flowers. If like many brides; you do not have a scrapbook prepared then we at Todich Floral Design are always happy to spend time showing our portfolio of past weddings in our consultations. It is always helpful if you tell the florist as much information as possible, we would love to hear about your dreams for your big day and what you would like to achieve. Approximately how much should a couple budget for their flowers, in proportion to their entire wedding budget? Approximately 10-15%, we always ask about your budget at the very first meeting, as it’s extremely important to agree on how much we are working with before starting on the design concept. We will then try to accommodate the design agreed within that budget, and when the proposal is accepted, we stick firmly to the budget unless any further additions are requested by you. A bridal bouquet should cost anything from £45.00 upwards. A really simple bouquet shouldn’t cost an arm and a leg but, equally, a bride who wants local English flowers should be prepared to pay as much, or more, than a conventional bouquet. Is it true that flower prices fluctuate throughout the year? If so, by how much do these prices fluctuate? We however warn that brides should be cautious of choosing their wedding date over busy public holidays; florists are very busy around Mother’s day, Valentine’s Day and Christmas, which means flower prices will always cost more at these times. What else should a couple consider when selecting a florist for their wedding day? Couples should feel confident and trust their instincts, if you feel you are on the right wavelength with your florist then this is a good start. Don’t feel pressured to spend over your budget but be open to new floral designs and ideas; Give the florist a chance to share different and even unusual designs with you. Sticking to one type of flower and one style can often limit creativity and flexibility with different styles. We find that 90% of the time, when a bride is shown a completely different arrangement, they fall in love and this is often the one they choose. This entry was posted on Friday, February 3rd, 2012 at 2:19 pm	and is filed under Interview. You can follow any responses to this entry through the RSS 2.0 feed. You can leave a response, or trackback from your own site.